This card was made for my niece, Izzy, who was baptized. The doll was from the Paper Doll Dress Up and the face was stamped w/ the Peachy Keen stamps. 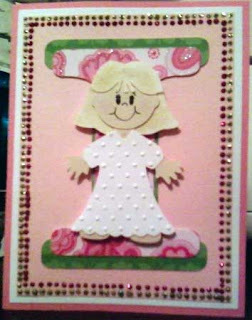 I used Plantin Schoolbook cartridge for the letter I. I embossed the dress w/ the Cuttlebug Swiss Dots embossing folder.